The renowned South African Sprint Runner, Oscar Pistorius was released from jail late Monday, South African officials said, and will serve his remaining sentence under house arrest after a year behind bars for killing his girlfriend Reeva Steenkamp. 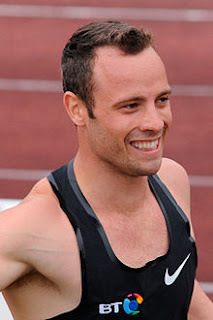 Pistorius family spokesman Anneliese Burgess said that he was at his uncle Arnold’s house in Pretoria, adding that the family was “hunkered down”. She said that the family would issue a statement later Tuesday. tonight,” correctional services department spokesman Manelisi Wolela said in a statement on Monday evening. Pistorius had been due to be released on Tuesday. “It will be very good. He should have been released on August 21,” his lawyer Brian Webber told AFP, hours before his release. The ENCA news channel said Pistorius’ parole conditions included an instruction that he must meet Steenkamp’s parents if they wish to do so. Her parents had contested his early release, but said no sentence would bring back their daughter. criminal lawyer Martin Hood told AFP.